Let’s face facts. The wonderful benefits of having good, solid friendships in your life are irrefutable. Having supportive friends enables us to live healthier, happier lives. And it works both ways; being a supportive friend helps each of us to become a better, more empathetic individual. Some people come and go in our lives while others will remain for a lifetime, but the actual time span of any friendship isn't what really matters. What’s most important is that our friends love us for who we are. So let’s chat about other things that make a good friend. someone who will love and support you—in good times and in bad times. someone who respects you and would never deliberately hurt your feelings. someone who is loyal, nonjudgmental, and kind. someone who is emotionally available and willing to listen. someone who is willing to cry when you cry. someone who lifts your spirits and makes you laugh. 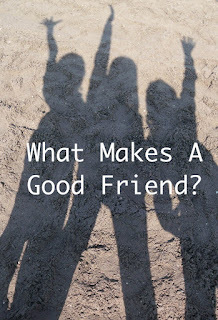 What made me wonder about the makings of a good friend, you might ask. Well, I’m working on the second book of my Ocean City Boardwalk Series—a series about 3 women friends who work and live and find the men of their dreams in Ocean City, Maryland—and in book 2, one of the women betrays another. This is what made me ask myself what makes a good friend. What traits do you look for in a good friend? Have you ever been betrayed by a friend? Were you able to forgive? Did the betrayal destroy your relationship, or did the experience draw the two of you closer? Let’s talk about what friends mean to us, and what we mean to our friends. Thanks for stopping by today! Labels: #friendship, Am I A Good Friend?, Donna Fasano, friendship, Girlfriends, How to be a good friend, What Makes a Good Friend? Thanks, Donna, for reminding me how much I value my friends! Lyn, I understand what you mean. Without my friends, I'd be lost! I love my family, but I also love my friends. We "do life together." Good friends are an important part of life. Thanks for reminding us. I have friends since elementary school. We kept contact through the years and the distance, letters, phone calls, emails, all helped. And yes I have been deeply disappointed by a BFF. I let go of the bitterness, but the friendship never went back to what it was when we were twenty.